Tomorrow elected officials are breaking ground on a Staten Island office building with a bocce court, giant rooftop farm, a nearby vineyard, and a social enterprise restaurant that will serve Italian food and donate all of its proceeds to charity. 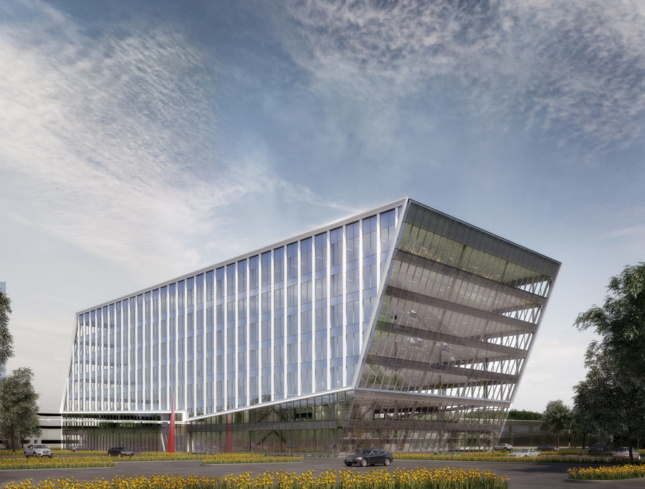 Developed by The Nicotra Group and designed by CetraRuddy, the eight-story structure is part of Staten Island’s Teleport Campus in Bloomfield, not far from the Arthur Kill on the Island’s west shore. Compared to the rest of New York City, “designing for Staten Island means there’s more space to work with,” said Eugene Flotteron, a partner at CetraRuddy and a borough native. Right now, there are two low-slung 1970s office buildings on the nine-acre campus, directly adjacent to the new structure, which will contain mostly office and medial facilities. Structually, there was room for the south side to slope sharply towards the ground, minimizing solar heat gain, and a north side that’s angled more gradually up to draw in the rays. On the ground floor, a white overhang will shade the main walkway and line the building on four sides. 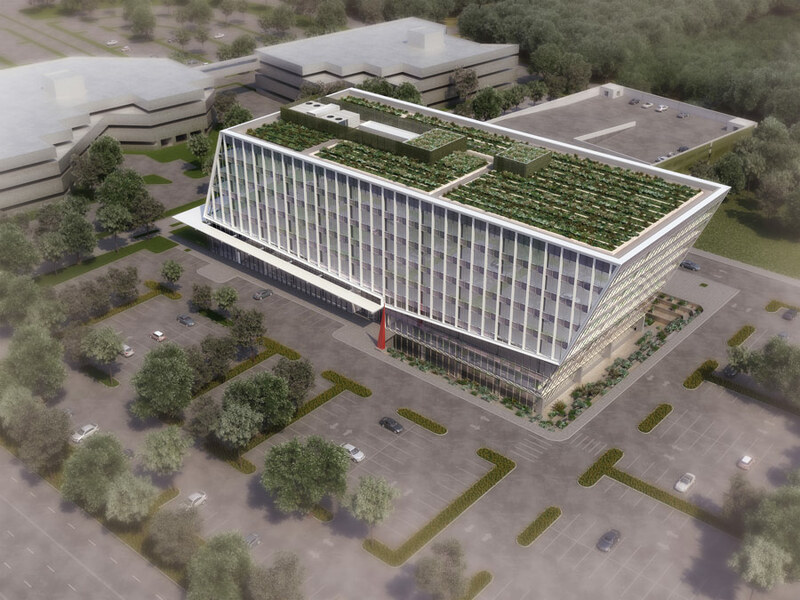 Up above, a 40,000-square-foot rooftop garden will provide herbs and produce for the in-house restaurant, and grab-and-go greens from the rooftop will be for sale, too. Limited public transit options make ample surface parking a necessity, thought the structure is aiming for LEED Silver certification. CetraRuddy is collaborating with a local firm, Being Here Landscape Architecture & Environmental Design, on the rooftop and ground floor landscaping. The 336,000-square-foot office building’s program reflects the developer’s heritage as well as the heritage of more than a third of Staten Island residents with Italian ancestry. The restaurant, Pienza, Pizza, Pasta and Porchetta, is named for Pienza, a Tuscan town that The Nicotra Group founder Richard Nicotra and his wife visit every year. Among other amenities, visitors will have access to bocce courts outside and a vineyard that Nicotra is building with specialists from California’s Napa Valley. While the design doesn’t have a direct antecedent in Italian or Roman architecture, Flotteron said finishes and materials like the Italian marble in the double-height lobby, as well as a potential collaboration with an Italian curtain wall company, will reflect the country’s influence. Foundation work is set to begin in the next few months, and the project should be complete in fall 2018.